According to the latest government statistics, the UK’s gas and electricity consumption is continually increasing year-on-year. However, as our energy consumption increases, so does the amount of energy created by alternative means. In 2016, 8.9% of the UK’s total energy consumption came from renewable sources, with renewable electricity representing a highly credible 24.6% of our total electricity consumption! Which makes sense when you consider the advances in technology and the shift in our cultural perception of renewable energy and its ever-increasing significance. Think about it, how many more homes do you see with solar panels on the roof compared to a few years ago? What was once a science-fiction novelty, reserved for the likes of the International Space Station, is becoming common place across the country as people explore ways of generating their own energy, free from fossil fuels and unclean production methods. Whether it’s a bank of solar panels, the odd wind turbine, or large biomass boilers, the UK seems set on reducing its environmental impact and opting for less damaging ways to create energy. Undoubtedly, this is an on-going and lengthy process – and there aren’t any immediate fixes that solve the oil crisis or give us unlimited energy. For the time being, the UK’s small steps towards a green and renewable future is a sign of things to come. These steps, coupled with existing legislation, such as the EU’s Ecodesign Directive that sets new minimum energy-efficiency targets for all electrical products, forces us to consider the place of electric storage heaters within a wider environmentally friendly framework. Can storage heaters be made to run on renewable energy? Will they still be economical? Will they still even exist? It’s time to explore the mechanics of storage heaters and see how they can be adapted for use with alternative energy. Storage heaters work in conjunction with a cheaper night-time energy tariff, such as Economy 7. Through Economy 7, electricity used at night is less expensive than electricity used in the day. Storage heaters take advantage of this and draw power from the wall at night. This power is stored in heat retentive ceramic bricks and periodically released the following day. Modern storage heaters allow you to set the charge rate, the amount of heat released, and provide advanced control such as weekly programming. The mechanics of storage heating isn’t that complex, which bodes well for running them on renewable energy. In theory, running storage heaters from, say, solar panels shouldn’t be any different from running them on electricity from an energy company. Providing you have enough energy to spare, using a storage heater in conjunction with renewable energy would be the perfect way to economise. Your solar panels charge throughout the day – and your storage heaters charge throughout the night: a perfect balancing act of energy-efficiency, with each component relying on the other. That sounds simple enough – but is it actually a viable option? While we’re not yet at the stage where renewable energy is accessible to the masses, it is becoming an increasingly popular choice for homes across the UK. Newspapers and online magazine are always talking of individuals who’ve made renewable energy work for them, selling the surplus electricity back to the energy supplier and living in a totally self-sufficient utopia. While this is true to some extent, becoming eco-efficient isn’t as simple as chucking some solar panels on a roof and sitting back as the money rolls in. Becoming eco-efficient can be a lifestyle change as much as anything else – with multiple factors affecting your success. Realistically, as it stands in 2017, there are two types of renewable energy that can contribute to running an electric heating system – storage heaters or otherwise. Solar power, or photovoltaics if you prefer the scientific term, is the most popular source of alternative energy due to its (relative) ease and money-saving potential. We’re all vaguely familiar with how solar power works. Cast your mind back to your school days, specifically double maths on a Tuesday afternoon. Do you remember those calculators with grey strips on them? If you covered these strips with your thumb, like I used to, the calculator would die, and it would be useless. Those calculators contained teeny-tiny solar panels, using the same principal that larger solar panels use to harness the power of the sun. The grey strips on our old school calculators contained small-scale photovoltaic cells. These cells absorb light and convert photons into electrons – providing electricity. Larger solar panels, like the kind you see on rooftops, use hundreds of these photovoltaic cells to create enough electricity to run various household appliances. Typically, a 3000w-4000w solar panel array will generate enough energy for a family sized home. Let’s break that down and see how much energy we have to run our storage heaters. Per 250w solar panel, a daily average of 1000w is produced. Let’s say, for the sake of easy maths, that you have a storage heater that uses exactly 1000w of electricity per hour. For an entire night’s worth of charging, your storage heater will need 6000w of electricity. Or, six 250w solar panels worth of energy. According to the latest data for 2016, on average, a UK household will consume 4000w of energy per day. So, to run one storage heater, and your entire home, you would need 10,000w of electricity – and a blooming good amount of sunshine. You can see where this can start to get complicated. The location of your home, amount of sunshine, number of solar panels, how energy-efficient your home is, how many appliances you have on standby, etc, etc, will ultimately affect how much energy you produce. If you live a very minimalist life, chances are you’d be more than okay with a modest bank of solar panels. If you’re a house of six, with four children and four TVs, games consoles, mobile phones, and whatever else, chances are you’re going to need your own solar farm before you see the benefits of renewable energy. Despite this, all is not lost. Advances in renewable energy happen on a yearly basis, fuelled by necessity, and driven by research. In the last twenty or so years, solar power has advanced from powering old-school calculators to powering entire nations! It’s entirely feasible that, in a few years’ time, solar panels will be more than capable of powering our entire homes with energy to spare. Our faithful favourite, the storage heater, can be the Ying to renewable energy’s Yang – providing an entirely eco-friendly way to heat your entire home, with zero environmental impact. Let’s face it, England isn’t renowned for its sunshine. For rain and wind, however, we’re top of the class! Wind turbines, the sort you see offshore, are obviously several metres too tall and several millions of pounds too expensive to stick in your garden. Micro wind turbines, however, are a smaller and more convenient way to get a hold on renewable energy. You might have seen the odd small-scale turbine outside a rural home, and you can get even smaller versions that attach to the gables of your house. 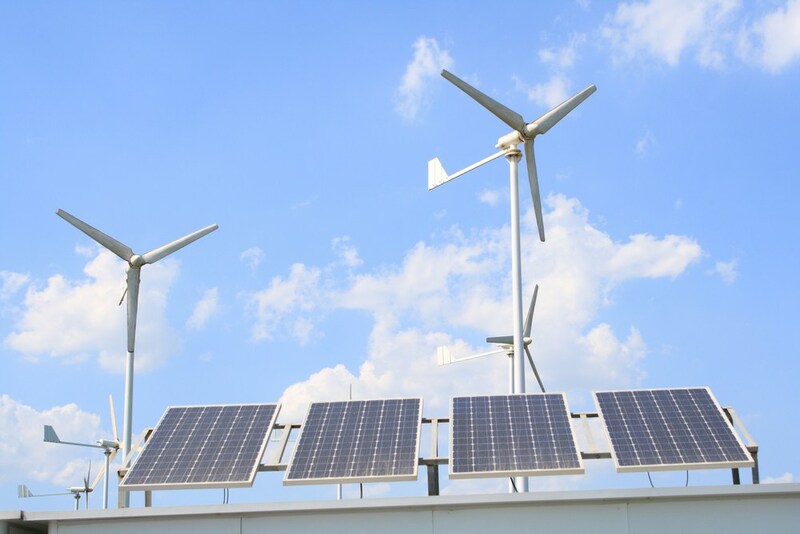 Wind is, quite naturally, free, and once you’ve paid for the initial cost of a micro wind turbine, you have the potential to reap the rewards of free, eco-friendly energy every day. Wind turbines are significantly simpler than solar panels. Wind hits the blades, the blades spin, the spinning motion turns a small generator, and electricity is produced. The higher and bigger your wind turbine, the more chance you have of harnessing wind energy – which is why the large-scale turbines are so tall. For domestic use, wind turbines suffer a reduction in efficiency – which is why they generally create less energy than solar panels. For a £3000 roof-mounted turbine, approximately 1000w is produced per day – depending on how windy it is. Considering a single solar panel produces a similar amount of wattage to one micro-turbine, wind power creates less usable energy in a domestic setting. One micro turbine would roughly power one storage heater for an hour, which isn’t the greatest statistic. At best, the energy created by domestic micro-turbines can supplement the cost of your energy bills – eventually reimbursing the initial costs of purchasing and installing. After that, any savings you make are all a product of free, renewable energy. Which, to some extent, will contribute to running your heating. Letting power go to waste is inherently inefficient. One of the fundamental issues with generating electricity, by renewable or conventional means, is finding a way to store it for later use. For small amounts of energy, batteries are the preferred method. For large quantities of power, batteries aren’t quite sophisticated enough. In Wales, a hydro-electric generator called Electric Mountain has an ingenious method of harvesting excess energy. To create the energy in the first place, water flows down a mountain and passes through a series of turbines. The water is then pumped back up to the top of the mountain using any surplus power, continuing the cycle of renewable, clean, and green energy. Profoundly simple and effective, Electric Mountain is pure eco-efficiency in motion. For domestic renewable sources, storage heaters offer an ideal platform for utilising excess energy – providing daytime heating from energy that would otherwise be going to waste. Even if you only manage to heat one room for a few hours, it’s more energy-efficient than having to find other means of heating it. If you already have an adequate way of storing the power generated from renewable energy, it might be worth considering an even more efficient way of heating your home and opting for an electric radiator. Whether fuelled by wind, solar energy, biomass, or coal, storage heaters are an eco-conscious way to take your first steps to a greener future.